I know it has been awhile since I've posted. This year, I decided to host (first time) Thanksgiving dinner. That meant I was headed for the kitchen to cook and headed to my craft room for decorations. I told everyone that I felt official after staying up Tuesday (before turkey day) until 3:30am and the following night until 1:30am. All this for hosting 9 people. YES!! And it was worth it. My first order of business wasn't the menu, but some holiday decor that my family could take home with them. Hubby and I cheated a little bit. We did have a friend's nephew fry our turkey. Hubby would have done it had he had the fryer though. This bird was DELICIOUS! Sweet potato casserole. The first time I ever made one and it was so good, that I only had a small bowl left. So, I went out the next day and purchased 10 more sweet potatoes and made 2 pies and a mini casserole. YUMMY!!!!!!! Thanks for stopping by! Next on my list, reorganizing the Cafe and getting some holiday projects done. 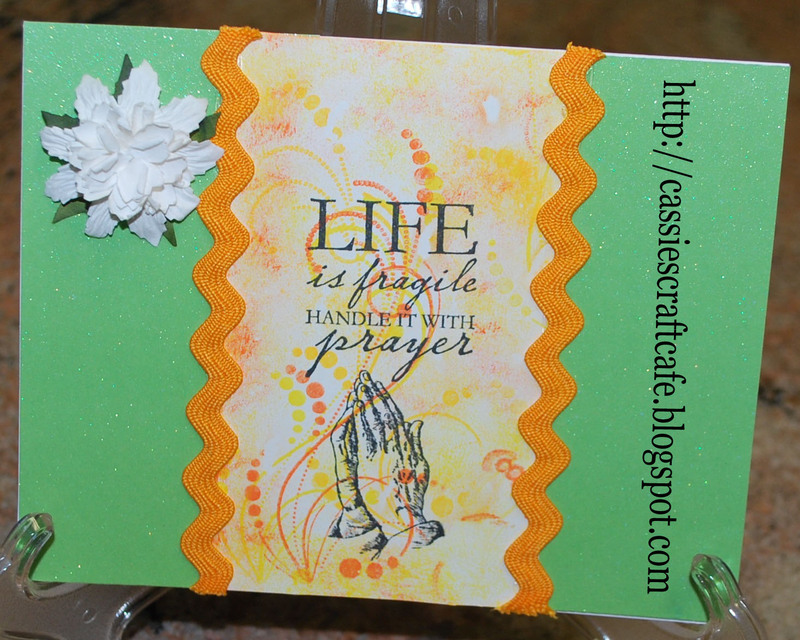 ModPodge Designs Scraps Fall Harvest Blog Hop! 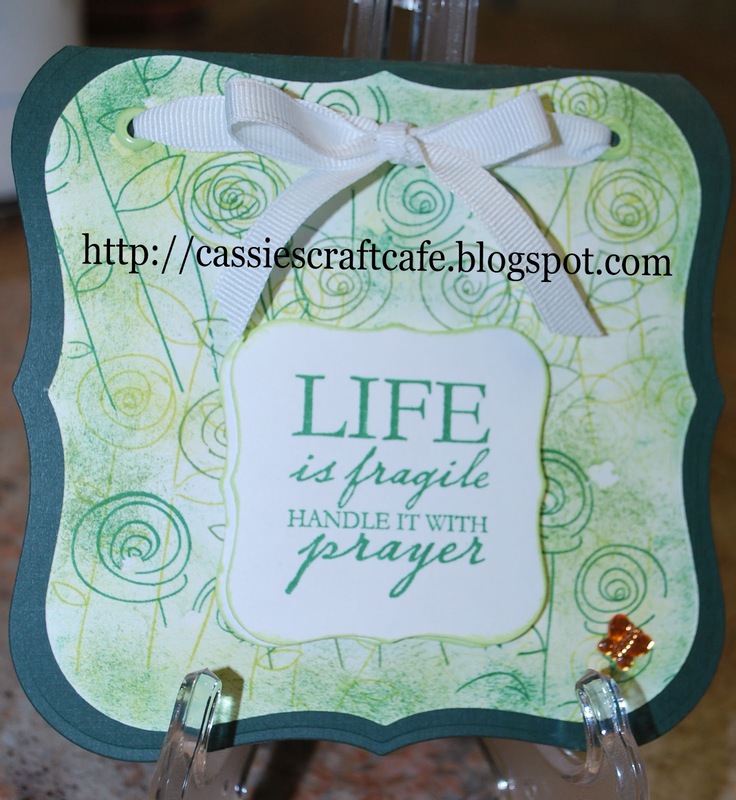 Welcome to the ModPodge Designs Scraps Fall Harvest Blog Hop! 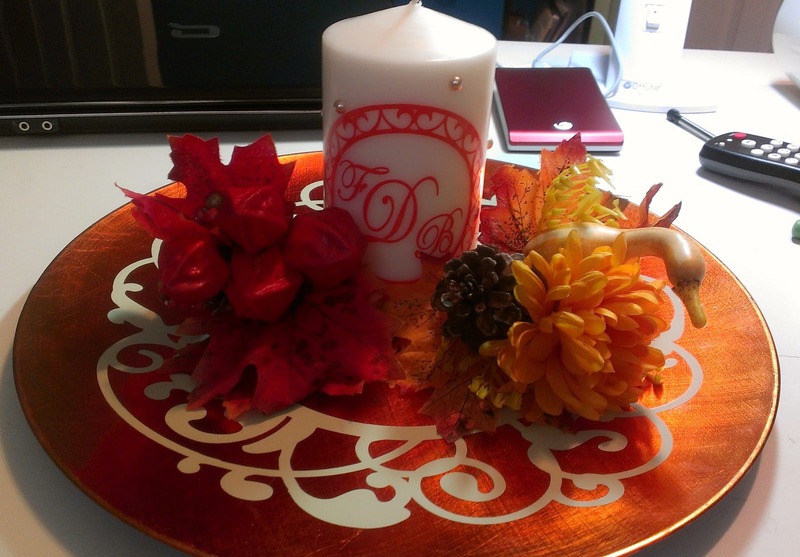 For MPDS' inaugural blog hop, we will are featuring autumn projects to celebrate this great time of year! There will be giveaways on various blogs throughout the hop, including a special MPDS blog hop gift for one lucky visitor! To be eligible for that prize, you must comment on all the blogs by 11:30pm EST on Nov. 4. From all of the eligible readers, one will be randomly drawn. The winner(s) of the blog hop gift and all of the blog candy prizes will be posted on Tuesday, Nov. 6th. If you hopped over from Cyndi's Blog, you are in the right place. If not, be sure to start at the beginning and hop all the way to the end. 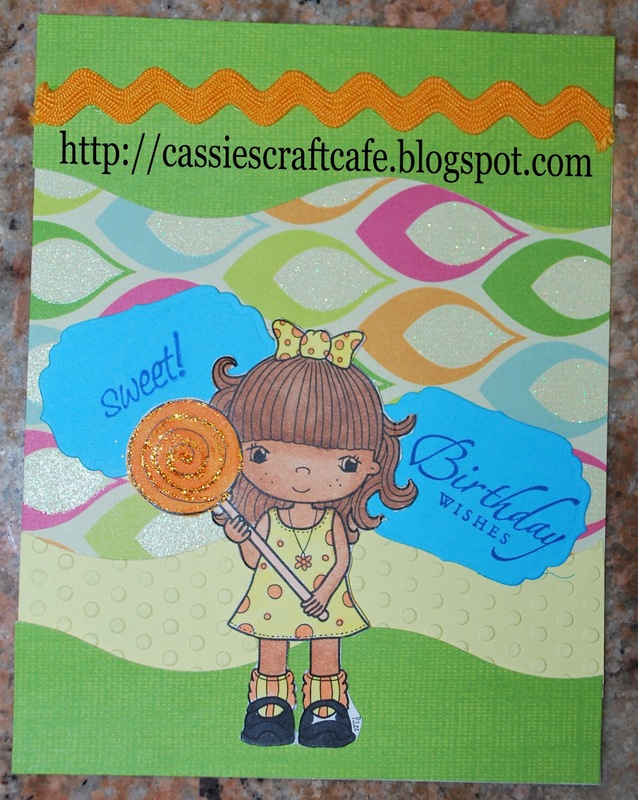 Their is Blog candy available and projects to inspire the season. For the past year, I've been thinking about hosting my first Thanksgiving Dinner. I was real excited about doing it this year because my mother is coming to visit for the entire week. I still have not decided but I wanted to practice setting the table anyway. I found this Charger at Target. It's hard to tell but it's dark teal. is the true measure of our Thanksgiving"
Finally did a Tile Coaster. I can see how these can become addictive. Thank you so much for stopping by. I hope you enjoy the rest of the HOP! 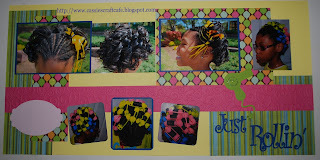 It's time for you to head on over to Cheryl L's blog for your next project. Have a GREAT weekend all and REMEMBER: set your CLOCKS BACK 1 HOUR Saturday night! Last week I tried to play catch up on some much needed cards. Several of the images were colored weeks maybe even two months ago and I am just getting around to actually using them. Thanks for stopping by and taking a look. During my crop last month, I was re-introduced to the Unity Stamp Company. I came home and immediately started browsing their site. The first order I picked up 2 stamps and the second order, 3 more. I had fun coloring these. I am entering the pink skates in the Mojo Monday #265 Sketch Challenge. I love this blog when I need a sketch to get me going. Lastly, I cannot remember who the author of this image is. After my flashdrive crashed, I had to search high and low for my digis. The feathering technique (what you see on the gowns), I learned on youtube. Friday - Add embellishments and tadaaaaa, a layout was born. That is essentially how you prepare a page kit to take to a crop with the exception of doing those steps at once and not gluing down until you get there. I've actually decided that I need to get back to doing layouts that way so I can actually get some accomplished. OK, the reason you are here.... the layouts. The first 2 is something I've never done. Create a LO for each child's album of the same event. 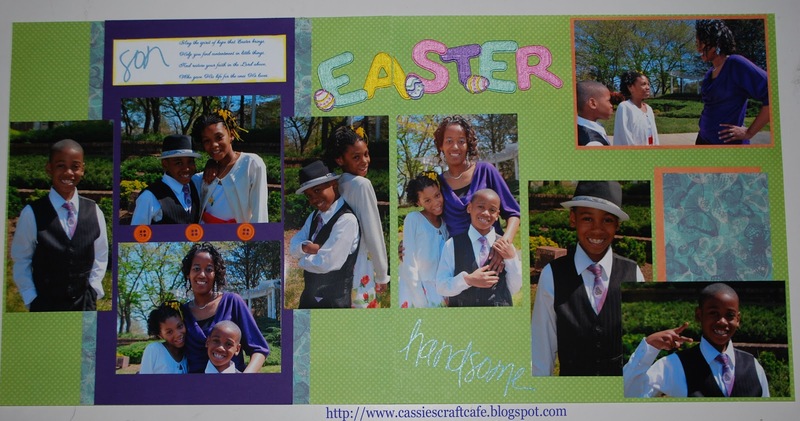 I usually reserve those for the family album, but I was feeling generous for these Easter layouts and I had just as many joint pictures as I did of them individually. the pink label to the left is for her to journal on. It's funny to see this layout since I'm still scrapping his K year. I'm scrapping all over the place. Good Evening Family, Friends, & Fellow Crafters. I am not only recovering from a scrapbook retreat, but now I have a cold. When I arrived at the retreat, my sinuses were going wild and I was off all weekend but I kept pushing through because scrapping is too much fun not too. I think between the constant temp changes and the rainy packing, I am under and out. On to the projects. 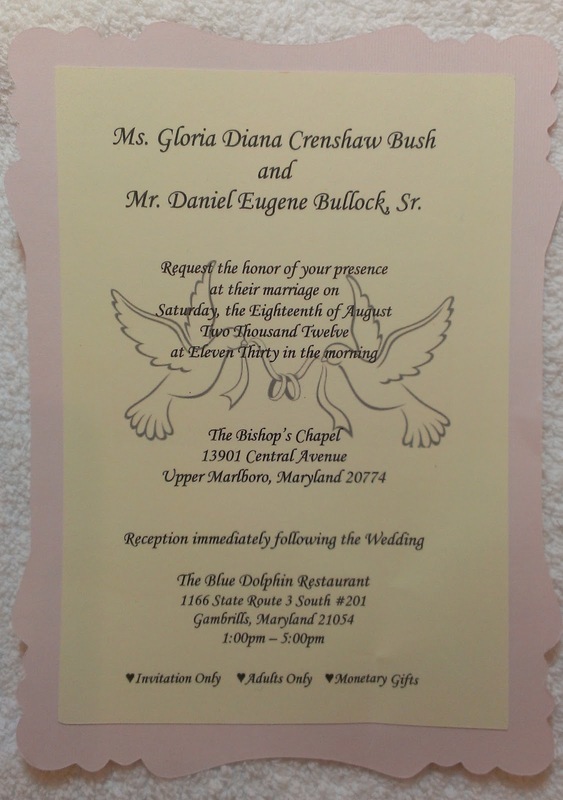 The last few wedding invites or programs I've done have been oddly shaped. I like the challenge at times and this ice cream is one of them. Whether with tissue paper or vinyl, decorating candles is fun. The first project is a centerpiece for my aunt who had her co-workers over for dinner. The other is a wedding gift for one of my scrappy friends. We surprised her at the crop over the weekend with a mini album and the charger set below. I put glue on the rim and base of the glass, then poured glitter over it. 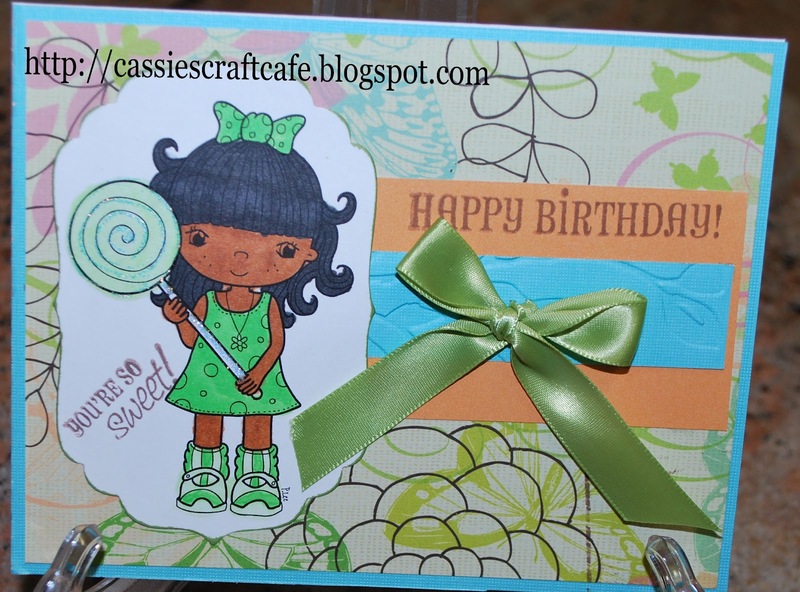 The card was made by fellow crafter: Joy Medley. Hello Family, Friends, and Fellow Crafters. Sending my sincere apologies for being M.I.A. over the last few months. What can I say? Life has truly been busy. BUT, I'm ready for a crafty comeback. I have missed my personal crafting time. I say that with a smile on the horizon, as I am enjoying a 4 day weekend scrap retreat as I type. As a matter of fact, I am 51 minutes away from being up 24 hours! So stay tuned, I should have some projects to share like this shirt I made yesterday to wear today. Happy Friday Family, Friends, Followers & Fellow Crafters!!! Hmm, say that 5 times fast. I had some downtime at work the other day and I decided it was a good time to get caught up on my crafty emails. 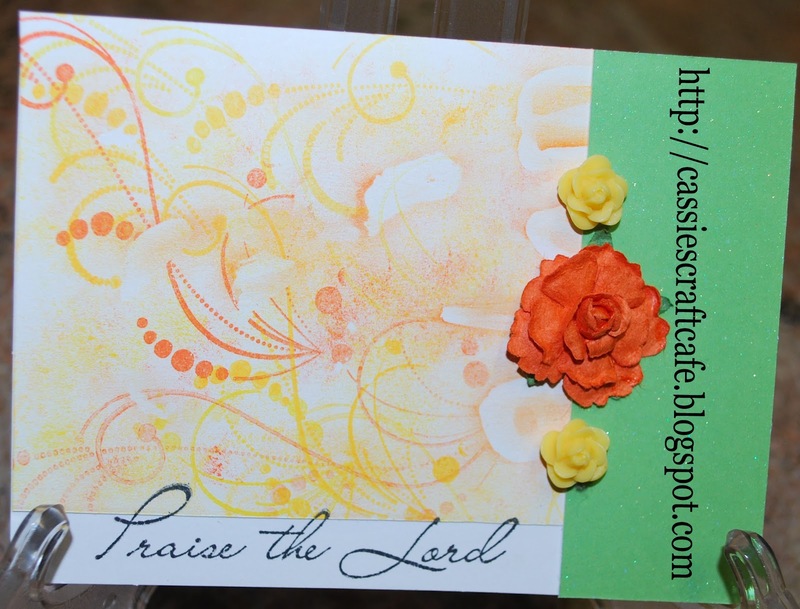 I caught up on 6 newsletters from Splicoaststampers and man am I glad I did. I learned a new technique, called "Fluid Masking Resist". I couldn't wait to go to Michaels for the supplies and get started right away. Click HERE to read the tutorial by Heather Telford. I've been falling in love with my copics again. So much so, that in the last 2 months, I've added 14 more to my collection and have now outgrown my 72 wallet case. Now what do I do? Keep coloring, LOL!!! Here are two birthday cards for me to keep on hand. Every year I look forward to my Church's Women's Retreat. There is sure to be a move of God like never before. From helping to plan to watching it come together, to watching God move on the women. This year, we were instructed to bring a box with us. Why a box?? God has given us so many talents and gifts and yet we sit on them. Our retreat focused on recognizing what those gifts are and how you can use them at home, work, and in ministry. We then took those gifts (which we symbolized by writing them on pieces of paper) and filled our box, nicely wrapping it and celebrating by presenting our gifts to God. One of my favorite quotes (the author unknown since I spotted this on a cubicle wall over 6 years ago) is "Everything you were born to do, you were built to do." Everything you need to succeed in life has been given to you by God, you only need to recognize those gifts and move forward!!!! Table Centerpieces: We are divided into group names based on our roommates. So, instead of the standard table tent cards, I covered these white boxes (which I got at Michaels) to use as our centerpieces in the dining hall. Here is a sample. Gift Bags: We love a good giveaway. Oh the excitement as you anticpate your name being called. Instead of solid colored gift bags, I decorated plain white bags to display our theme and color. 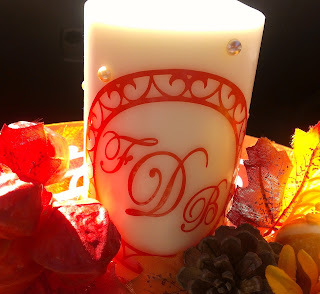 One of the gifts: Always wanting to put my crafty fingers into a contribution, I made a candle, using the tissue paper method. For those who don't know, here are some quick steps: (1) tape tissue paper to a standard 8.5 x 11 sheet of printer paper. 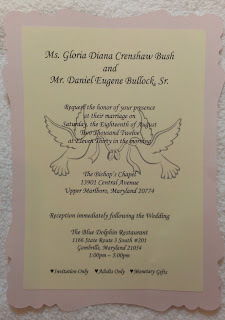 (2) Print your design on the tissue paper, using your printer. (3) Place the tissue paper design around your candle. 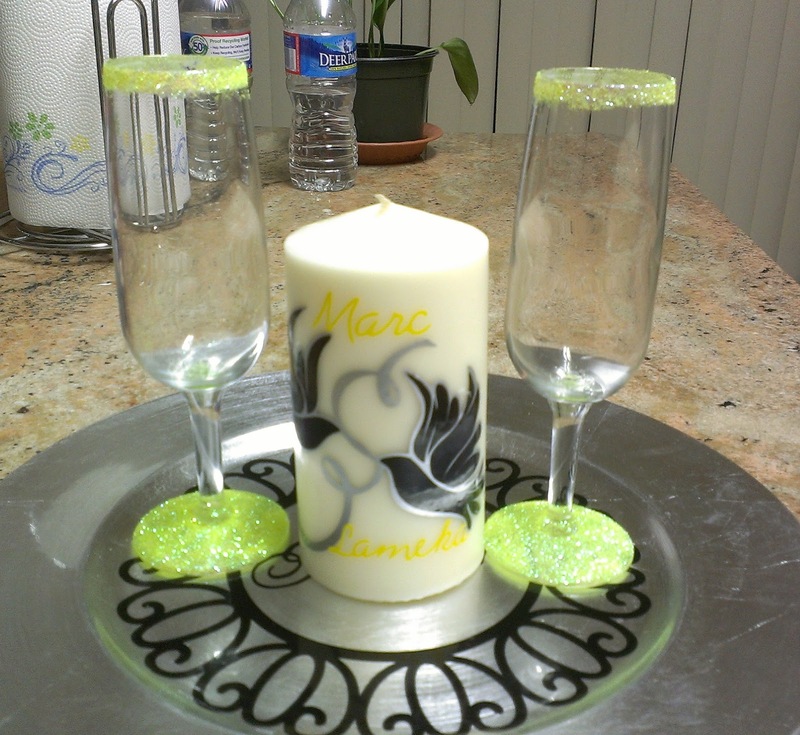 Place a piece of wax paper over the design and around the candle as well. Leave enough that you have something to hold on to, as you proceed to the next step. (4) Using your heating tool, begin to run the heating tool over the wax paper. 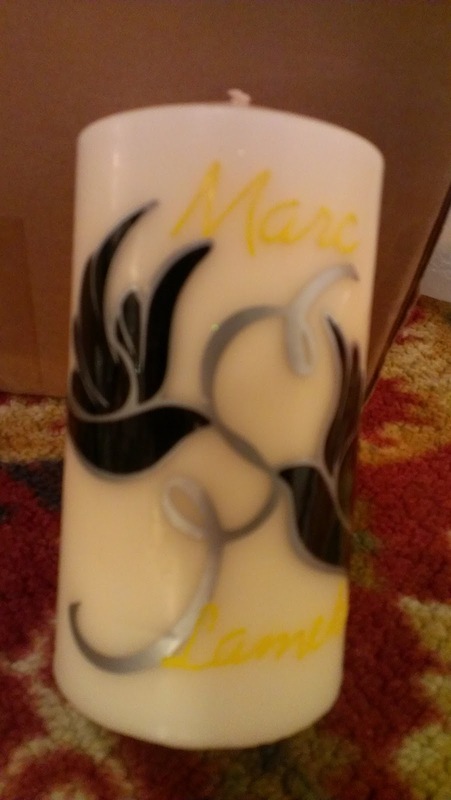 You should see your design slowly melting into the candle. The paper will become glossy/slick/wet looking. Be careful not to melt the candle though. This works best when your candle and tissue paper are the same color. For starters, try with white because it's the easiest. And lastly, my own personal box. 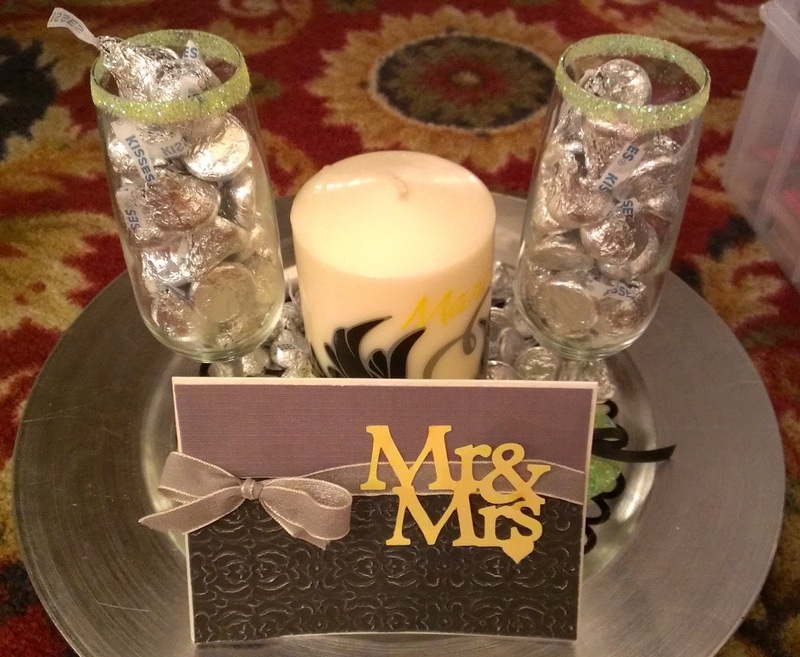 But wait, I created one box and brought it to the meeting to show the overseer what I was doing for the centerpieces. One for the committee members claimed it has her own. We spent an hour on the phone about that particular box. So, I caved in and let her have it. The next box, I was making for myself. Finished it, then decided maybe I want one slightly bigger. So that box was taken by another committee member. Then finally, the night before leaving for the retreat, I get all the paper cut for my box. I only bring the supplies I need, so this box cannot get taken away from me. LOL!! Cross was cut on posterboard using Easter cricut cartridge. The title was cut using Storybook. Sorry for the lengthy post. It's been awhile since I've posted a personal project. Which is only 1/2 personal huh? Thank you all for taking the time to stop by, read, and leave comments. Hello Family, Friends, Followers, and Fellow Crafters. The Blog Hop was officially over Monday and the results are in. Please email me your information at cassiescraftcafe@gmail.com and let me know which giftcard your sweet tooth desires. Thank you for everyone who took the time to stop by, leave a comment, and become a follower. To be eligible for the SOC Blog Candy, you had to post on all the blogs that were participating in the Hop. The winner is...Nitasha!! Congratulations!! Please contact our hostess Cheryl for your fabulous prize. This weekend marks the official start of summer--days filled with a little travel, fun, and relaxation with family and friends! So to celebrate, I, along with some talented crafters, have teamed up to share projects that display summer fun! Of course, a blog hop isn't complete without blog candy! 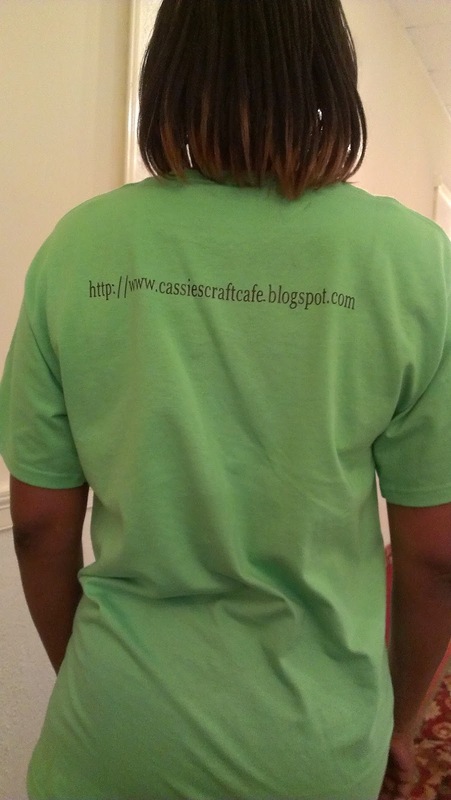 There will be giveaways on various blogs throughout the hop! Plus there will be a SOC blog hop gift awaiting one visitor!! To be eligible for that prize, you must comment on all the blogs by Mon, June 25 at 11pm EST. From all who are eligible, one lucky reader will be randomly drawn. The winner will be posted on all the participating blogs on Wed, June 27. Cassie ----- YOU ARE HERE! On to my projects. I am obsessed with mini albums. What's not to love? My project below take you to the beach, where you can create summer memories in the sand. Grab your shovel and pail for some fun in the sun! YES!! There is BLOG CANDY to be had!!! And something that is near and dear to my taste buds. 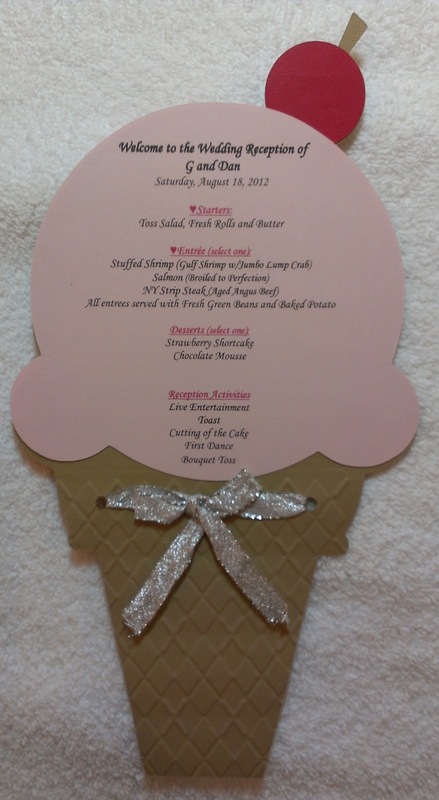 I SCREAM, you SCREAM, we all SCREAM for ICECREAM!!!!!!. 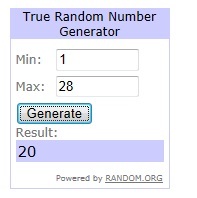 The lucky winner chosen by random.org, will win your choice of Rita's or Cold Stone $10 giftcard. In order to win, you must be a follower of my blog and post a comment below. In addition to the giftcard, choose one of the mini albums displayed on my blog during the hop, to help get you started for a day at the beach. The second album will be posted by Monday.